By this stage of my hunt for the perfect fountain pen, I was building up a picture of what I liked to write with… the Cross twins had poor nibs, but were a nice size; the Platinum 3776 Century was highly attractive to me—black and gold, understated elegance, and a beautiful nib, that was just a bit too wet for my daily use, and if I was honest, was just a bit small for my preference. So, I was looking for a big pen, or at least bigger than the 3776; a smooth nib, and a distinctive style that wasn’t too loud, or too flashy. Also, I’m not keen on piston, pump, or vacuum-only fillers. I like the flexibility of carrying cartridges for emergencies, and they are so easy to just pop a fresh cartridge in the pen, whilst on a plane, a train, or in a meeting away from home turf. Also, by this stage, I had read a lot about where to buy my pens, both online and bricks and mortar shops, and the what was available in my budget… which wasn’t inconsiderable, but wasn’t quite ready for my Nakaya grail pen just yet. This time, I wanted to try my pen before I bought it, which means, unless you’ve got a handy pen show coming up in your area, you’ve got to visit a bricks and mortar retail shop. Jolanta is amazingly helpful, and has a wide and wonderful stock. Visit her store, you will not be disappointed! But, I hear tell they have a great store, and a friendly knowledgeable crew behind the counter. These guys are simply brilliant; their staff are the most helpful, knowledgeable people you could hope to meet, absolutely nothing is too much trouble, and you can try any pen they have in stock, before spending your money. They also happen to be the only Toronto-based stationers with their full range online, with a truly excellent delivery service. There were only two real contenders on my shortlist, the Sailor 1911L in black and gold, with a bold, 18K gold nib, and an Edison Collier in burnished gold, with a two-tone, steel, 1.1mm stub nib. I’ll go into my reasoning for the Sailor 1911L rather than some of its more popular brethren in the Sailor line-up in a later post. For now, the Edison Collier deserves some explanation as well. Edison handmake all of their production and signature line of pens, from a variety of truly beautiful materials with patterning unique to each pen. The Collier is one of their biggest pens, large in diameter, and long even without posting the cap (which you can’t do). 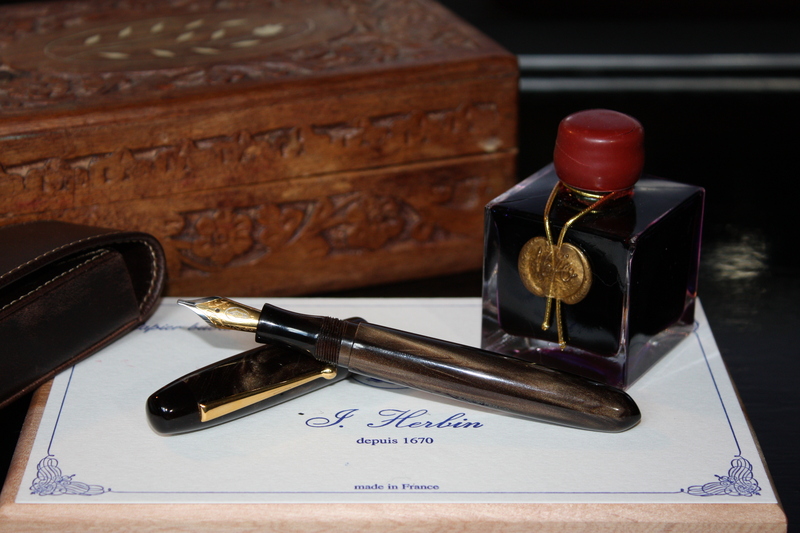 Lastly, the Edison Collier takes standard international ink cartridges, a converter, or (with a little silicon grease), can be filled using an eyedropper to pour ink directly into the barrel of the pen, thereby providing an extremely large ink capacity, and the greatest range of flexibility. All my checkboxes were ticked. It only remained to try the pen. No photograph, and especially not one of mine, can do this pen justice. The patterns in the barrel are a beauty to let your eyes wash over. The length of the pen, at almost 13cm was extremely comfortable in my hand, and despite its large diameter (see the table below), it isn’t heavy, or tiring to use for extended periods of time. 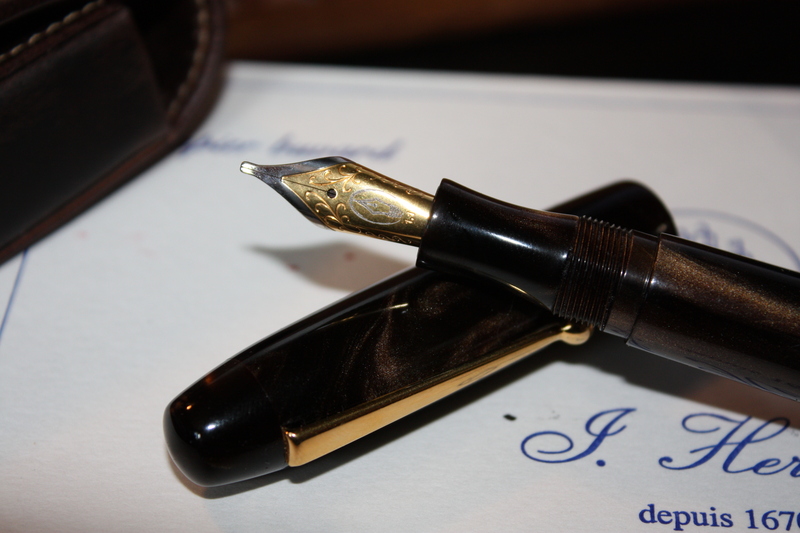 The Edison Collier in burnished gold, with two-tone, #6 steel, 1.1mm stub nib. Well, the nib has been a bit of a saga, involving losing my first nib entirely, and replacing that with a matching unit in my first week of ownership. In addition, at first, the steel nib was a little scratchy. 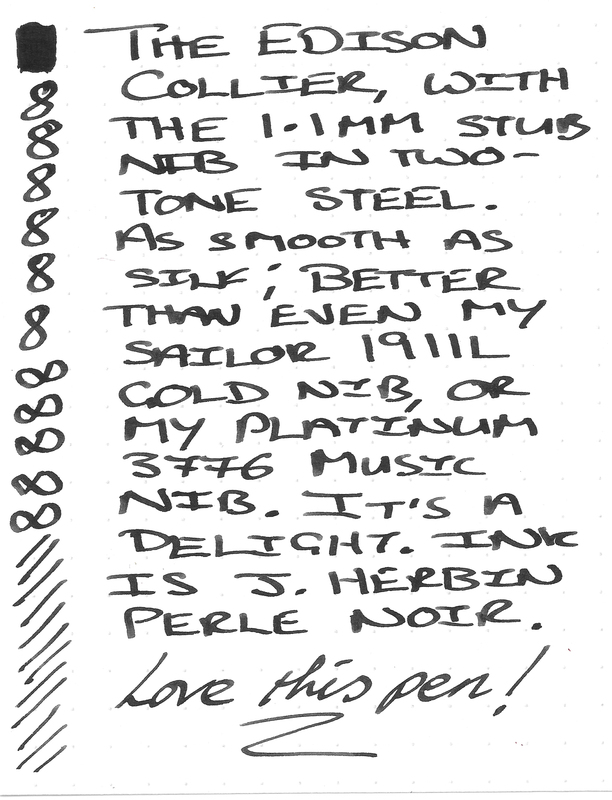 However, with the aid of the lovely Jennifer at Best Fountain Pen, a little gentle rubbing down coaxed the 1.1mm two-tone, steel stub into a finish so smooth, it really does now rival the Platinum’s music nib for effortless gliding across the page. And I have reconsidered buying the 18K gold nib for now, because the steel is simply so good, I can’t justify the upgrade price at the moment. Especially when I have another spare steel nib, sitting in a box in my desk drawer. I will however, give readers a little warning: rubbing down a fountain pen nib can render your pen absolutely useless. If you’re not extremely careful, the process can completely ruin your nib. 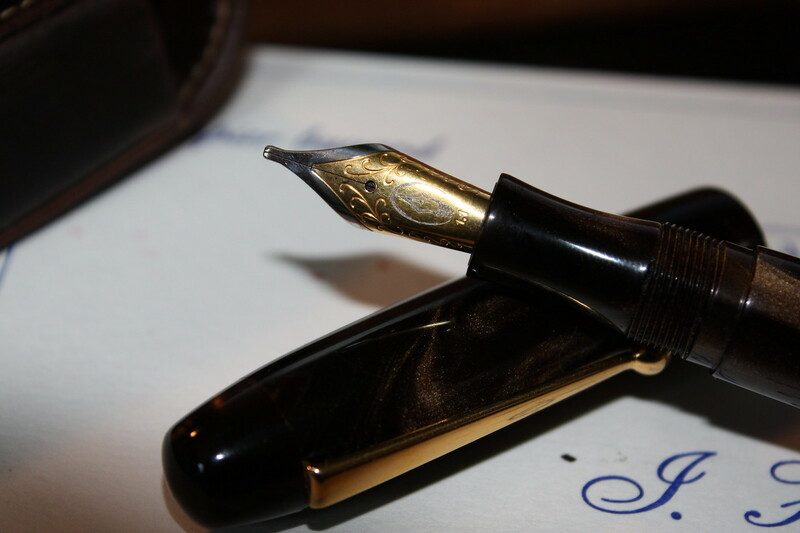 My advice is to never rub down a fountain pen nib that you cannot easily and quickly replace with a brand new one. In this case, the Edison Collier steel nib is not prohibitively expensive, and I had quick and easy access to a spare. Writing sample from Edison Collier, steel 1.1mm italicised stub nib, using J. Herbin Perle Noire black ink, on Rhodia Dot-Pad 80gsm paper. 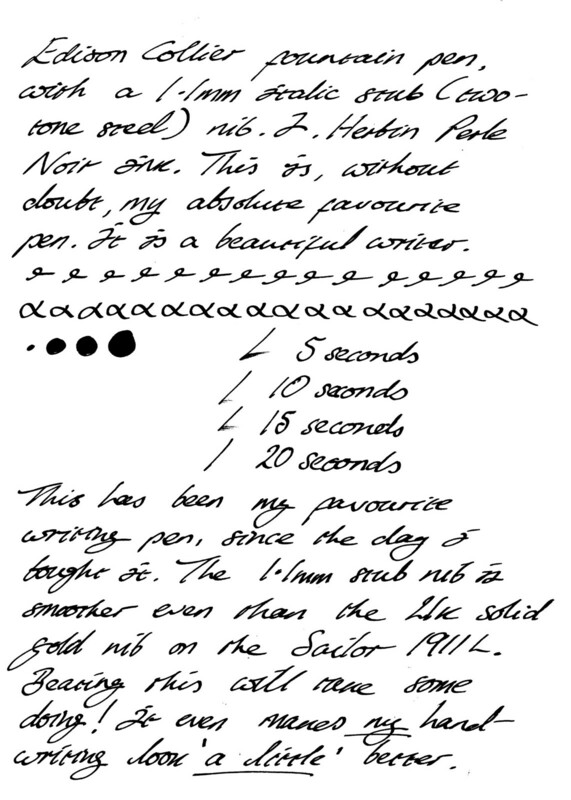 This writing sample was made on a Rhodia Dot-Pad (80gsm paper), using J. Herbin Perle Noire black ink. Writing in uppercase lettering like that was a bit of an error I think, it doesn’t really illustrate the variation in line width provided by the italicised stub. Also, it’s pretty easy for a fountain pen nib to perform well on high quality paper, and loaded with a designer ink. Well, the Edison still performs well on cheap university notepaper, and even worse printer paper. I take this pen everywhere I go, and it has never let me down. This sample provides a little more of an idea of the Collier as a daily writer—it’s still bloody marvellous. The paper used here, was Life brand Kappan writing paper, again from Wonder Pens. This is another high quality paper, with a slight, creamy-white tint, that doesn’t quite show on a scanned image.